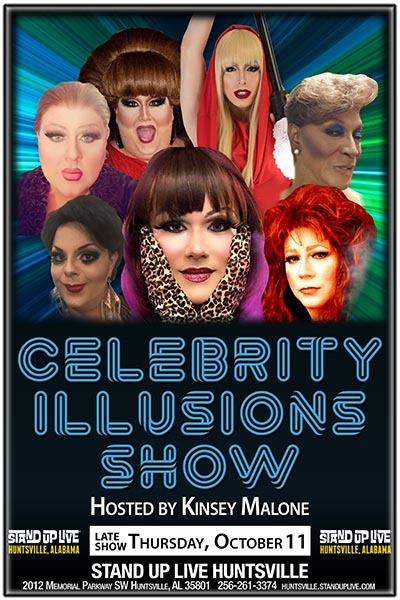 Experience Hairspray, Wynonna Judd, Whitney Houston, Lady Gaga, Cher, Reba , Adele, Shania Twain, Liza Minnelli and more, all on one stage at Stand up Live! You will be provided with an ever-changing variety of spot-on impersonators performing the songs and dances of world-famous celebrities. Guests will be impressed by the accuracy of the impersonators from all eras of Music. Also be prepared to laugh until you cry with Huntsville's Own "Mouth of the South" Kinsey Malone Hosting!